LAS VEGAS – September 4, 2018 –Barrett-Jackson has added a stunning 2015 Porsche 918 Spyder (Lot #749) to an impressive array of luxury and exotic supercars for its 11th Annual Las Vegas Auction at the Mandalay Bay Resort and Casino, Sept. 27-29, 2018. Also headlining this year’s exotics is a 2018 McLaren 720S (Lot #748) that comes from the first year of limited production for the second-generation Super Series and a ’99 Shelby Series 1 Convertible (Lot #739), which is one of a handful of the cars built equipped with the optional supercharger package. 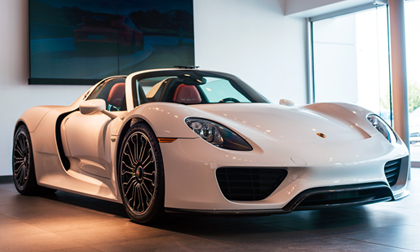 Featured in very rare white over red interior, Lot #749 is a one-owner 2015 Porsche 918 Spyder with just over 300 actual miles and a 4.6-liter V8 engine with automatic transmission. Never before offered for sale to the public, it comes equipped with many of the factory options, including full interior carbon-fiber package and front axle lift, along with all paperwork, books and keys received at delivery. A 2018 McClaren 720S (Lot #748) will also be among the star headliners during this year’s Las Vegas Auction. Powered by a twin-turbocharged V8 engine, this supercar boasts an acceleration of 0-124 mph in 7.8 seconds and a top speed of 212 mph. With special-order Black Amethyst paint, carbon-fiber mirror arms, rear deck engine covers, sill panel, diffuser and aero bridge, the exterior is just as impressive as its speed. The first and only car designed, engineered and built from the ground up, as a Shelby, by Carroll Shelby, a Shelby Series 1 (Lot #739) is the quintessential American supercar. This car is #34 of just 249 produced, and is one of the approximately 60 Series 1 roadsters equipped with the supercharger package offered by Shelby as an optional extra, bumping the power from its 4.0-liter V8 engine to 450hp. Ferraris will also be among the featured marques during the Las Vegas Auction. An ’05 F430 Berlinetta (Lot #702) ushered in two world firsts for a production car, including the electronic differential (E-Diff) and the steering-wheel-mounted Manettino switch. It’s powered by a 4.3-liter alloy flat-plane 90-degree crank V8 engine, pushing this Ferrari from 0-62 mph in 3.9 seconds with a top speed of about 200 mph. The recipient of a complete, professional restoration, an ’86 Ferrari 328 GTS Targa (Lot #701) is powered by a 3.2-liter 8-cylinder engine mated to a 5-speed manual transmission and had an engine-out service done at 34,800 miles.